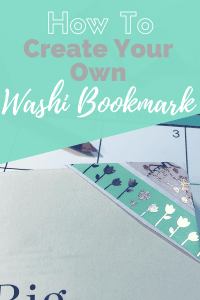 Create your own beautiful washi bookmarks. Super simple idea that you can do right now. Ok, admit it. Are you one of those people who fold over the corner of your page to mark where you left off? I totally do this. I’ve been guilty of dog earring most of my books. I’m not proud of it, but that’s the truth! I’ve tried to use bookmarks but I tend to lose them. 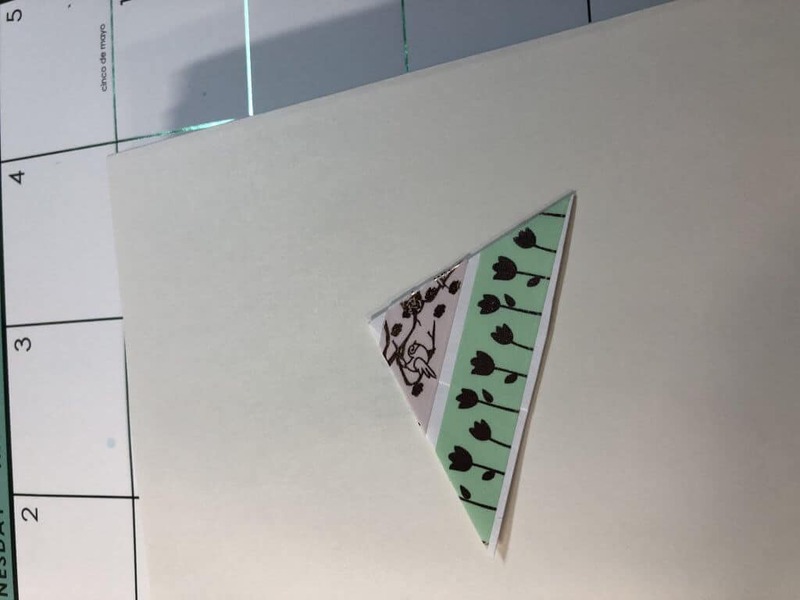 Well, last night on Facebook I learned this really neat trick to make my own corner bookmarks using part of my washi collection. I’m SO EXCITED to share this with you. (Unfortunately, I don’t know where this idea originated or I’d point you there). I like the idea of a corner bookmark because I can just keep it on the page until I need to move it! Brilliant. I’ve had this one box of invitation envelopes since my wedding nearly a decade ago. They’ve been sitting in my cupboard lonely with no real use. I barely mail things out any more and when I do it isn’t in an invitation envelope! You can use any envelope you have hanging around the house, even ones that held junkmail! 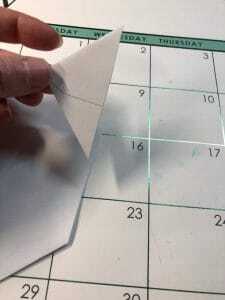 Cut the bottom corners off of your envelope. You can make this as large as you’d like, but I wouldn’t go smaller than an inch or so. Pick out a couple of washi tapes that look good together. 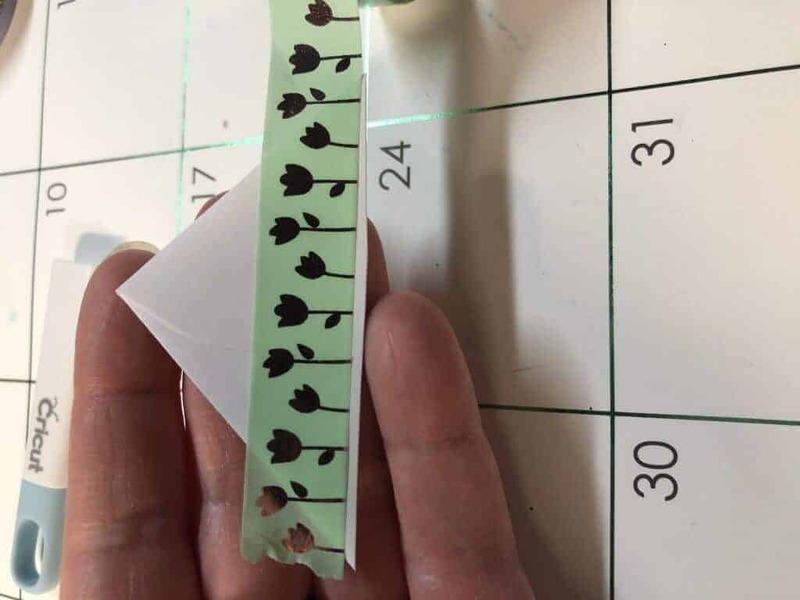 You could also use just one washi tape pattern for the entire thing. The amount of washi you will use really depends on how large your corner is. Tape your corner straight across. Then cut off the edges to match your triangle (corner). You cut up right to the edge rather than folding it over. Repeat with more washi to cover this side of the bookmark. You can choose to put tape on both sides of the bookmark or only one. If you chose to stop after taping just one side, the other side would remain white. 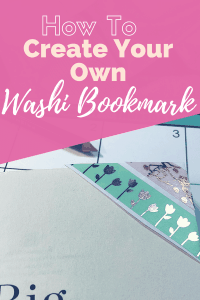 Stick your washi bookmark on the top corner of the page you are reading as above. I highly recommend that book by the way. 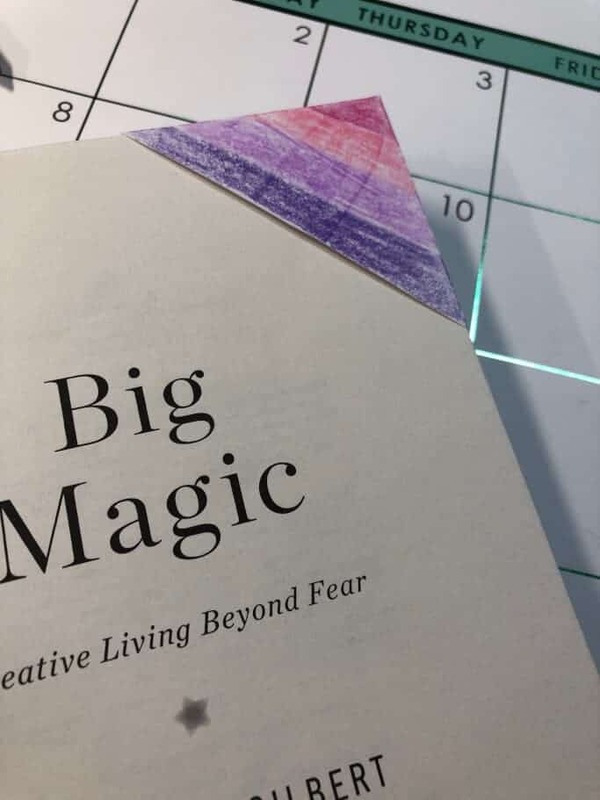 Big Magic is all about creativity and allowing yourself to get past fear and be creative. 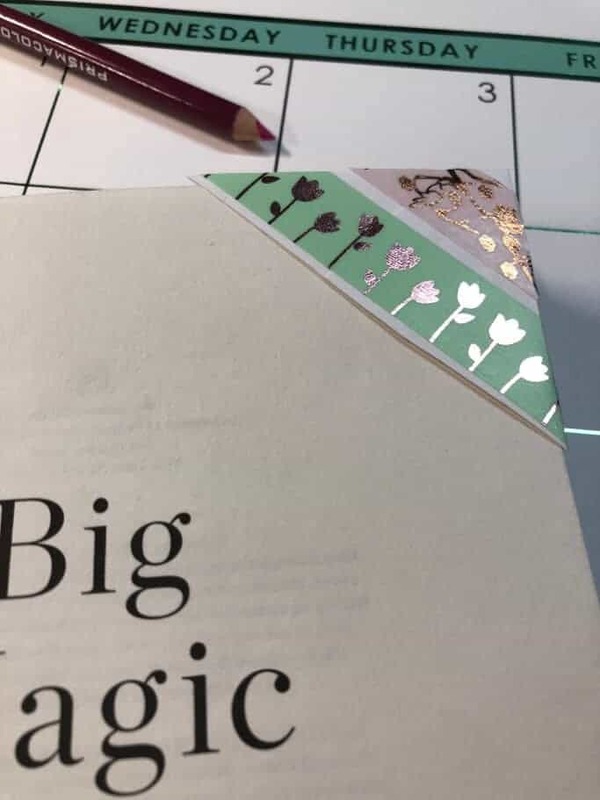 If you put washi on just one side of your bookmark you can always have the washi side facing the page you left off on. 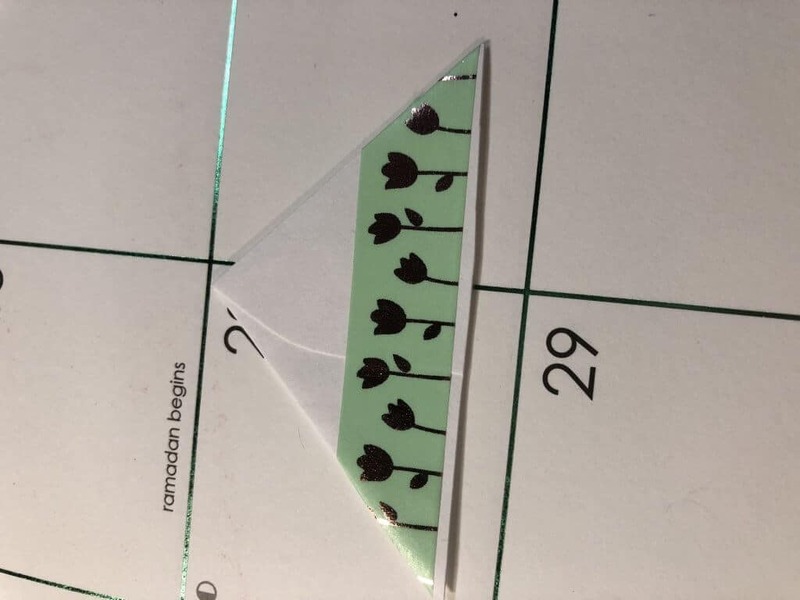 This is kind of like dog earring the page, but instead of bending it, you stick your corner bookmark on there. 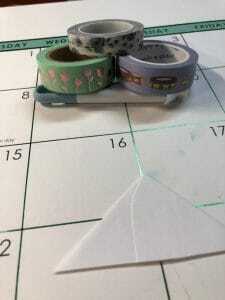 If you did washi on both sides like I did. (Who can resist playing with washi??) you just have to remember which side indicates which page you are on. That’s it! You’ve created your very own bookmark. What do you think? Leave a comment and let me know.